Last week, the surreal spectacle of the 2016 presidential election got even more surreal when Republican presidential candidate Donald Trump appeared on The Tonight Show to prove that he can, in fact, grow hair out of the follicles on his very normal, super mammalian, definitely-not-a-lizard-being-from-outer-space head. Either that, or that he can afford hair plugs. Honestly, as long as you’re not calling him poor or overweight, you can say whatever you want about Trump. He doesn’t care. 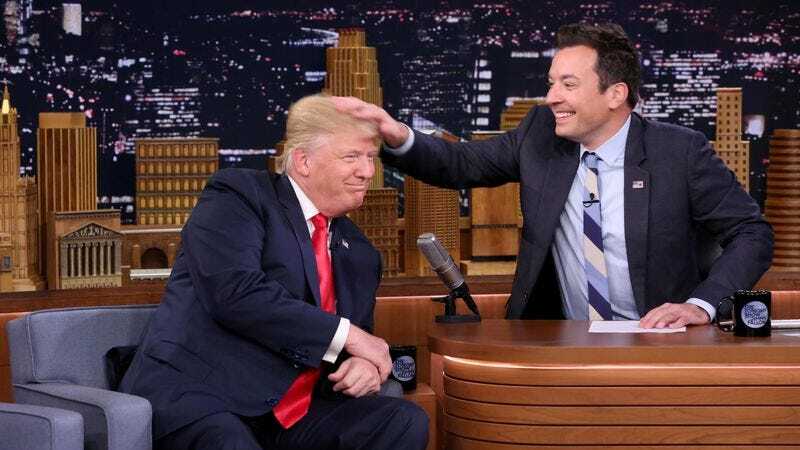 “I’m not one of those ‘gotcha’ people,” Fallon says, clarifying that Trump knew about the hair-tousling bit in advance. “He was a good sport.” Asked more directly if he thought the backlash against the interview was justified, Fallon repeated the same point, saying, “Have you seen my show? I’m never too hard on anyone.” He then repeatedly says that concerned viewers should “vote,” then adds that he’ll have Hillary Clinton on his show “Monday” (today), and that he just isn’t a partisan type of guy, you know? This is basically the same point The A.V. Club’s Sean O’Neal made in our Crosstalk about the interview, in which he asked, “Did we really expect Fallon to challenge Trump here to anything more than a lip-sync battle?” However, in that same article, our own Alex McCown countered, saying, “You don’t ask David Duke to play Snapchat games and beer pong, and the same should go for any other hate-monger.” No such corrective existed in TMZ’s interview of Fallon, although that could be just because the valet had pulled Fallon’s car around by that point. After all, the tough questions are coming from some pretty unexpected places these days.